Depart Nairobi, the capital of Kenya, at 07:30am on your 04 day Masai Mara/Nakuru Safari tour through The Great African Rift Valley and Narok Town. Arrive in time for lunch at your preferred lodge to include leisure. An afternoon game drive will follow to explore Hemingways country and Lion, Cheetah, Elephant, Buffalo and other animals of the same order. Stay at Mara Sarova Camp, located on the southeast boundary of the Maasai Mara on a natural hill between two streams. Spacious tents have private terraces and hardwood floors, and are complete with electric light, flush toilets, and hot water. Enjoy a dip in the large pool, or an evening lecture with local Maasai guides. Area activities include game drives and nature walks with resident Maasai naturalists in nearby areas outside the reserve. Dinner and overnight stay at Campsite. This natural wonder of Masai Mara is to be explored now which includes the extensive plains which include not only the well known predatory animals but also with Zebra, Wildebeest, Giraffe, Hippo and the dangerous Crocodiles. Breakfast, lunch, dinner and overnight at the campsite. Depart to Lake Nakuru National Park to arrive in time for lunch at the campsite. Set on a plateau in an elevation above Lake Nakuru, Sarova Lion Hill Game Lodge has 67 chalets all overlooking the lake, within the Lake Nakuru National Park . It is the perfect place to experience one of the world's largest ornithological spectacles, The Pink Flamingo, or a rich concentration of wildlife including black and white colobus monkey and is also a famed Rhino Sanctuary. 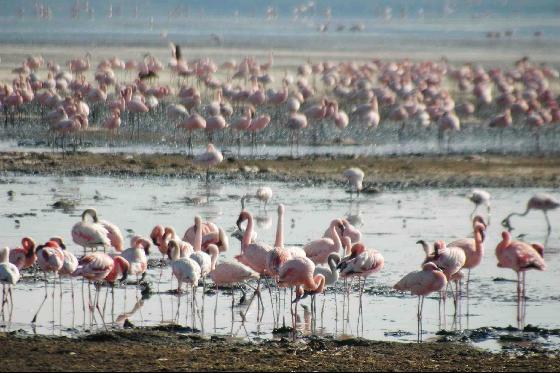 In the afternoon proceed on a game drive in this famous ornithological spectacle for flamingoes. Dinner and overnight at the campsite.